Post your strategies and post a name for with it. Get you electric shuttles + MRS towards enemy command post. Set off the Guards then just sit it out until they stop when they do reset them off. Or instead of damaging you go around with units that guards will pursue then lead them towards the command station. Send all units with cloaked to be on low power mode. Send the units to target enemy command station. While the units are cloaked unless they are tacyoned then the wont be tractor beamed or damage by enemy units as they won’t reveal them self. AI War - even the smallest units can make all the difference no matter how weak they are still quite capable of taking the hits. if it can Kill and receive damage then it worth its time other wise if it cant kill and cant take the damage for the higher surviving ships then it is worthless. As CPA or guards that been set free after you destroyed there command station. You go and skim around the attacking forces just staying within the spider’s range. With the trader active go to a planet that is pretty much the only way into your safe haven. On snake map it would be the next planet, on spokes it would be the planet in the middle of the spokes. Anyway, go take it over. Put your command center to the opposite side of the map up against the very edge of the building zone so the enemy ships have to travel quite a bit. Now build 2 FF at least one being MKII. Put 100 spider turrets in the force field and 100-200 sniper turrets around the edge of the FF's so their attack isn't decreased. If AI is using sniper ships then put a counter sniper in the middle of your FF. Place groups of 40 turrets of each type and MK you have unlocked on the sides and front of your FF this way anything that gets too close will die. Place 5 MKII tractors on the edge inside your FF. Place a mobile repair station inside your FF, anywhere as long as you know the range of it. Place 1 gravity turret inside your FF on the edge like the tractors, now place another 2 on the edge of your mobile repair range towards the enemy worm holes, kinda spread them out so that their affect range are just touching but still in range of the repair. Place 1 tychon turret inside your FF on the edge, now place 2 stealth tychon turrets towards the worm hole, I usually have 1 half way and another covering over the wormhole. Try and keep them around 700 range away from the straight line, in case AI uses tychon fighters. Placing mines are optional and I use them just for looks. So place 1000 in front of your turrets outside the FF. I do use heavy turrets occasionally, so place 4 behind the mines. Now you are done with Planetary Long Range Fortification. Time to upgrade it to Helm's Deep. When the trader comes around build 1 of each, Counter Spy, Ion Cannon MKII, Radar Jammer MKII, Mass Driver and Blackhole Machine. Pause all 5 of them and build them one at a time, from cheapest to most expensive, being the country spy first ending with the radar jammer. Now anything that comes through has to come with'en 1000 range, will get destroyed if under MKIII, have a bad day if its a dreadnaught and can not escape. Congrats! You have finished the fortification. Without using engineers and allowing all 5 special buildings to build it would take you around 2 hours. I have seen this fortification take on 1500 MKII ships. Raider starships are no problem, as soon as they get in gravity range they slow down to 8 speed and the turrets blast them away. The major threat this has are zenith autobombers and ever since i figured out I could use gravity turrets they are a low to medium threat now, Only if they go after a mine first so they can avoid the gravity turrets which could be fixed by placing more gravity turrets. once units die or you taken enough and have huge threat meter you if there any surviving you scrap to save cost & wasted ship cap slot for full newly created fighters & bombers to replace them as newly units for the defense. You have a enemy planet that you want right next to one of your planets, it works best if your planet is about to be taken so you can place your command center strategically. Use my previous post idea, Helm's Deep, but assuming there is no trader around the Planetary Long Range Fortification will do. Lets call it PLRF. Now, I don't care what kind of units you got for your main fleet, they are going to be sitting right in front of your fortification the entire time. Unless they are snipers, they can sit behind it. Now this works best if you got raid starships, but you can use other ships as long as they are fast and can pack a punch. Such as Auto-cannons. If the planet is MKIII use MKII raid starships along with your MKI's. If the Planet is MKIV then use all the MK's. Although I have used just MKI's for MKIV planets, but you will usually lose all your raid starships. If you got just the PLRF then go and send your raiders to destroy just one guard station and retreat. 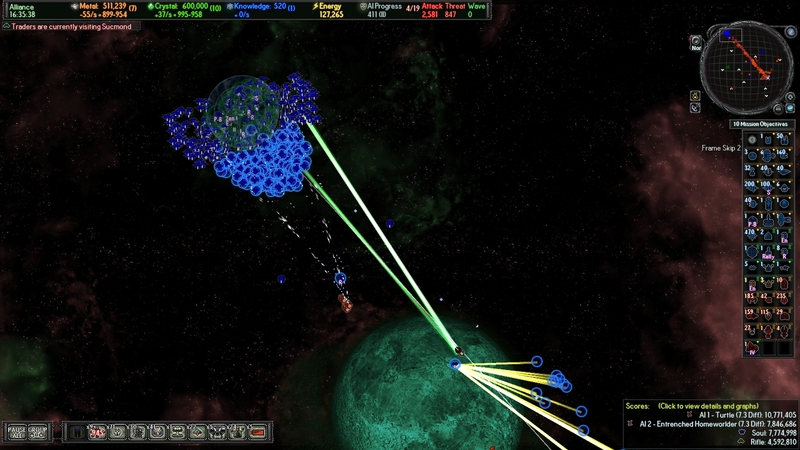 Allowing all the enemies to become free of the guard station and assault your planet. Your fortification should overwhelm them and disable all their engines. Now the snipers will slowly dwindle them into nothingness. Now you should wait until all the enemies engines are dead, but I usually wait until all the ships are destroyed. I also tend to use my fleet to clear the disabled ships out when I'm impatient. Go back in with your raiders after repairs and replacement troops. Repeat the steps above until all the guard stations are gone, so now aim for the special forces post. After that your next target is the command station which will release all their remaining ships, including starships, into your planet so if your worried about their numbers then place a few more turrets or reinforce with more ships. If your ships do engine damage, then wait for them at the wormhole, then fly with them back to your command station disabling more engines then spider turrets usually can handle. If your using Helm's Deep then you could do a couple more guard posts, but if the planet is MKIV then keep it safe and just do one guard station at a time. Remember, situations always change with AI progress and AI difficulty. I always play with AI's around difficulty 7 and I've used this tactic when AI progress is 300. So if you feel as though the fortification can use more fortification then it does. If theres a sector with 3-4k ships you wish to take without losing your entire fleet several times you can do following. -Then as the enemy ships move into your funnel they are Blocked by Tractorbeams, marked by Leeches and as they die and convert the 1% life ships you just got are protected by forcefields. -If possible have a lightning warhead ready, if the enemy density reaches to high you risk being overwhelmed but if you have enough tractor beams to hold 2k ships in place just 1 warhead will take them all out in an instant. -After all the enemy ships are dead (or most of them depending on how many of them flooded you) send in your fleet and clean up the sector, and rebuild adjecant sectors whos command center you had to destroy. find AI ion cannon. group units into 2 groups, group one is depending on the command station defenses rating. base of the scale is the amount of units is needed for use planet scale 0 so no shielding. use all 1 mrk levels ships in your attack fleet so all mrk 1 bombers, fighters, frigates, bonuses. this group 1 all rest of mrk levels are now in group 2 2-4. send in units group 1 then shortly after send them to attack command station then group 2 is sent and waiting at the exit do not move away from worm hole. once the command station killed by mrk 1 fleet group 2 can now exit the system sparing the loses. mrk 1 fleet is expendable and can be scraped. high difficulty planets require less Ion - fleet mrk ratio so if it mrk 3 ion on planet 2 then it be all fleets up to mrk 1-3 depending on difficulty. take 1-3 lower mrk attack force lower means more effective as less heavy loses so mrk 3 ion then take only mrk 1 ships sparing 2-3 as they don't need to spend longer in the ion infested system as they can easily take the worm hole out of the system as mrk 1 ships cannot. assign units into 3 groups. mrk 1-2 as 1,mrk 2-3 as 2, mrk 3-5 as 3.
send in units group 1,2, then 3 lower level ships will cause Ai ships to expend there payload thus leaving higher mark ships to live longer thus increasing effectiveness. this can be done by with large battles that are not near worm holes just send group 1 to go in close. group 2 to left-right then group 3 into the middle. What I like to do is to send in raid starships, and take out two systems away from my farthest system. That way the next system I'm going to attack will have it's supply disabled, and most of the ships will have attacked my main force, which will sit on my side of the wormhole, and smash them at anywhere from 2:1 odds, all the way up to 20:1 odds, depending on the size of the fleet, and the size of the force. Since a system with 2,000 ships in it doesn't normally manage to send them all at once, this means that a 2,000 ship fleet of my own can get at least 2:1 odds, and often more. Once the waves are defeated, the fleet moves into the disabled system, sweeps it clean, and then I capture it and sit at the next wormhole. Rinse and repeat. I've taken a couple screen shots for my strategies. One for Helms Deep and a new one for Autobomber Parade! This strategy involves setting up a spacedock with enough 10 MKII engineers or 20 MKI engineers and having enough resources to pump out an endless wave of autobombers MKI. I've had 9 planets according to the screen shot so I recommend to have that many planets before attempting this tactic. 30 Factories converting extra metal into crystal. Now for the actual strategy. If your economy can handle MKII Zenith Autobombs then might as well add it to the queue. If you like to have your autobombers constantly going to a specific planet then go to the map and place the spawn flag on the desired planet. Make 10 MKII engineers or 20MKI engineers then select them and click on your spacedock so they will concentrate on helping to build ships. This will make Zenith Autobombs be produce less than a second. I am not sure how many per second but multiple ships. Sit back, watch and relax as your autobombers will be in FRD mode and attack any ship that appears on the planet. It takes longer then using an actual fleet to destroy AI ships, but hey, its a use for them. Right after I came up with it my ally joined in and made a spacedock right next to mine then began doing the same thing. We heartily laughed about it for a minute or two then went back to destroying MKIV worlds. -Parasites - This really is a fun bonus ship to start off with, and has helped me roll over lvl4 planets early with extreme ease, and is why I am posting this strategy. -Repair Station - yes, bite the bullet and unlock this fantastic unit to repair all the units the moment you capture them, at least with this strategy. -turret net with detectors and tractor beams, or whatever is needed to detect and hold down, at least for awhile what the AI will pour through a wormhole. This is about as dumb as a strategy gets so it may be more of a basic tactic. 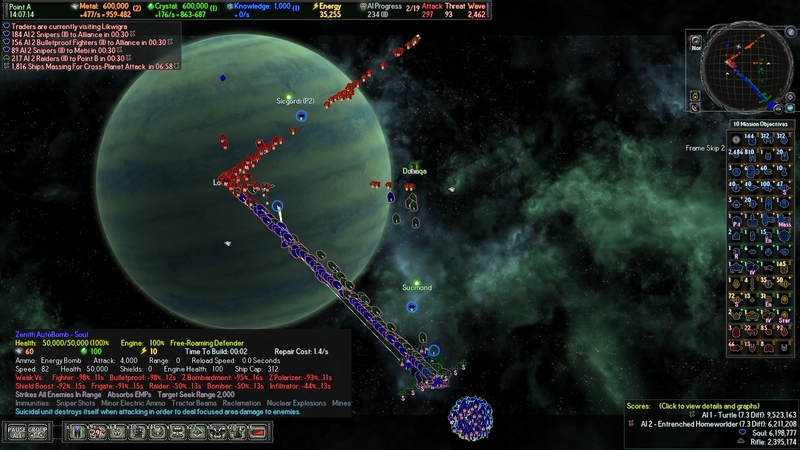 Run in with just your 1 transport if you're early in the game, and you have an unshielded ai command station to target. Simply pop it, load back in and try and beat the rush back to the planet you know they are going after. This gets more complicated if there are multiple planets the AI can jump to, so I suggest only using this when there is a clear target for the AI. On your side of the wormhole you will want to have already set up a bunch of turrets, a bunch of parasites, some basic units to help deal more damage, and have your repair station all nice and clumped very close to the wormhole. The entire point of this exercise is to give your parasites easy prey that can't run away. If done correctly you will easily increase the mark level and more importantly the variety of your units without having to spend research points on them. Of course ship survival rates with this strategy is fairly important so the repair stations are essential to any parasite fleet. I used this tactic early to pop a neighboring lvl4 planet and those early higher mark units make a world of difference. In fact you may get excited to pop higher level planets in this fashion. Just make sure you are well set up before hand or else you will have a disaster. Caveat: Energy... you need a lot of energy to pull this off, remember you have to power your enemies ships too when they become your own. So get that extra generator up early and get another planet. Consider springing for the lvl2 station to generate more resources early. An extra planet to plant more power reactors helps immensely so be aggressive if you want to try this out, and hopefully you're have some parasitic fun. Later game strategy: Essentially the same, you set up on the wormholes, shield bearers are great if you have them (or capture them) to go with the parasites. My home world I just intentionally left bordering the AI because I was so well set up to absorb ships as they came in, and they love getting aggressive on the home world, especially during a CPA. Just remember every once in awhile to rebuild some parasites that will eventually be taken out. If you have a location that you for sure know will be a boarder world, instead of using the repair station this would be a great spot for a fortress. I only wish there were more repairing unlockables. Eventually you will have to use a few engineers on some planets but hopefully if you expanded carefully you have focal points for your defenses, and you can keep your good repairing units in these systems. So really you're treating parasites more like a turret with this strategy, which suits them just fine because of their slow speed and short range. Of course dumping large amounts of units that include parasites out of transports is just as viable if you get proficient at loading and unloading those transports quickly. (I love transports btw! ) In fact I suggest everyone who has a problem think about 'how can a transport solve this' ... Anyway thanks for reading and yes I am fairly new at the game, but it sure is fun! this strategy is to get most out of your scouts and has 2 alternatives but you are managing these units a lot but if you want to explore and get most out of scouts then it OK.
Transporter: u can use this to get them past an worm hole then unload. make sure less than 10 then when 1 out put rest back in. keep doing this and use the transport to get them out and away from worm hole entrances. Offense/Defensive Deep striking:go place 7 engineers into transport then load up an colony ship then fill rest up with high level bombers. then attack the most valuable vulnerable planet that has limited shielding and low enemy count on there planet. take out command station and build urs. use the free bombers to split forces away from newly created command station. once it built start building defenses for that planet. slowly enemy die out if defenses can take it. this best used for key areas that you only need for short while. like advance stations or rebelling colony.